Discussion in 'Family Worlds' started by Phillip, May 10, 2010. The rare special "Henson's Place: The Man Behind The Muppets" will arrive on DVD for the first time on Tuesday August 3. Here are all the details on this anticipated release. Check it out and let us know what you think. Since most of us will be getting "Henson's Place: The Man Behind The Muppets", we'd like to mention that if you order the Henson's Place DVD from Amazon using this link, that a small portion of your entire order will go to Muppet Central to help keep the site, forum and radio running smoothly. It's a great way to help MC and get a great price on the DVD with a low-price guarantee. We greatly appreciate each person that helps support MC by placing orders through Amazon links on our site. That is indeed pretty awesome! Lionsgate has just been inundating us with Jim Henson stuff all of a sudden! Cool! It's been a long time since I've seen the 1984 "Henson's Place" PBS documentary, but from what I recall, it has some pretty good stuff on there. Very unexpected, but very welcome nonetheless. 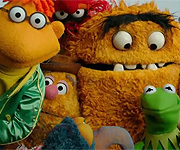 I'm just hoping with this splurge on all things Henson that we might actually get the rest of The Jim Henson Hour released and maybe really rare stuff like Little Muppet Monsters and Muppet Babies eventually. (Okay, I don't know where the rights cross paths here, so some of this may not be Lionsgate's call.) But in general, it's great to see so much Muppet stuff coming out! Hip hip hooray! Hip hip hooree! Great to see this is getting a release, and a great cover too. I already have it on DVD though from the European Muppet Show and Fraggle Rock DVD's, its a bonus feature. Hope this one has been cleaned up better though! Its a great show. Oooh! Interesting. It makes me happy to see that Disney is apparently playing friendly with Henson Co for this. Let's hope it leads to other things. This had to have been a nightmare to clear, since Disney, Sesame Workshop and Sony owned Muppets are all on the cover. It probably would have been easier to just do a floating head of Jim. I wonder what this means for the Christmas and Tales From Muppetland productions that feature Kermit. If we could get those uncut, I'd be very happy. This is awesome! Seeing the cover alone made my jaw drop. Seeing all these properties together in 2010 is just incredible. Hopefully, this means that we could see re-releases of Emmet Otter and Christmas Toy with the Frog intact come Christmastime and maybe Muppet Family Christmas this year or next. Geez, what obscure Muppet title could Disney release that would top LionsGate's releases? Yup. Exclusive interviews with Jim, Frank Oz, Jane Henson... and I think Dave Lazer and Lew Grade are in it too. 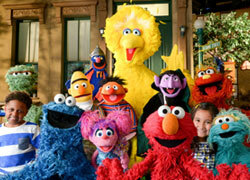 The whole special opens with a funny bit between Jim Henson and Big Bird. maybe really rare stuff like Little Muppet Monsters and Muppet Babies eventually. This is real exciting and unexpected news! I saw this on youtube a few years ago, and I forget just about every clip that appears (I should probably be punished for my irresponsibility). It's interesting that Elmo appears on the cover. I don't believe he appears in any of the clips. And this was made around the time he became a main character, possibly before Kevin Clash took over. It's also interesting how tv shows on dvd says that a lot of Henson documentaries have been released lately... Say what? I don't think any Henson documentaries have been released as the main program for a DVD. The documentaries for The Dark Crystal and Labyrinth have been released as bonus features since the first DVD releases of those movies almost ten years ago. And Down at Fraggle Rock has been on the Fraggle Rock first season DVD released in 2005. But if any past Henson documentaries have been released on DVD in the past year then I must be living under a rock in a cave or something. And there haven't been any televised Henson documentaries since Disney bought the Muppets. First Song of The Cloud Forrest, then Dog City: The Movie, then Sesame Street 20'th Anniversary special and now Henson's Pace! I can't believe it! Lion Gate is really doing great with Henson DVD releases! Now I have three Henson releases I can't wait to pick up! Or four if ya count The Muppet Show season 4 DVD set but a release date has not been announced by Disney yet. But now that they won the Webby Awards for Bohemian Rhapsody I'm sure that we might hear about a release date for TMS season 4 soon. Anyway, I an really excited about the new DVD release for Henson's Place and I can't wait to get my copy! I can't wait for this. I will go out and get it right away. I just saw this a few min ago on tvshowsondvd.com I can not wait to buy this i will be sure geting it the week it comes out . I have heard about this for years and i have always wanted to see it . Gong to be so great to have . I cannot believe how far Lionsgate is pushing all of this. It seems to me that all of the connections between Henson, Disney, and Sesame Workshop are really being worked on. Jim's spirit will certainly never die thanks to all of this. By the way, what can we expect in terms of bonus features? I know it's too early, but what is there to add with a documentary piece? Yeah, this kind of documentary is the sort of special feature you expect to be included on The Muppet Show DVD sets. I wouldn't mind if they wanted to include some sampling of Henson shows from the time period on this DVD set though- some episodes of Fraggle Rock, The Muppet Show and maybe even Muppet Babies would be appropriate I think. Oh yeah! I'm REALLY hoping this leads to an UNedited Emmit Otter release. Seems Lionsgate's relationship with Disney is much better than Hit and Henson's was alone. Or, maybe Disney is just more open with sharing the legacy in these past projects. Sony doesn't own The Dark Crystal or it's characters. Sony has had the video rights for over ten years, but as far as I know Henson still owns the rights to the film (and characters, of course). Thinking about special features possiblillities, does anybody know if Timepiece is included in Lionsgate's contract? Because this would probably be the best DVD to include that short. As a side note, does anybody know who owns Here Comes the Puppets and An Evening with Jim Henson and Frank Oz? I wonder if Lionsgate would rerelease those on DVD this year just because they possibly can release them uncut. There certainly would be fan demand (especially if Kermit were put on the cover). I think Lionsgate rereleased those last year when distribution changed (and A Christmas Toy was just released on DVD two years ago). I wonder if this sudden working relationship might be due to the Henson biopic in the works.